More and more, instead of smoking marijuana, people choose to vape. This option has ballooned in popularity. As opposed to burning the marijuana and inhaling the smoke, a device heats the cannabis until it releases the active ingredients, which are then inhaled. There’s a debate about the relative safety of vaping as opposed to smoking, but for our purposes, let’s focus more on how it may impact child custody. As this is relatively new, there’s not much hard data on the matter. Certainly since vaping produces no smoke, that means there are none of the risks associated with second-hand smoke. That’s likely to be considered a positive by some. That said, courts may also view this as similar to smoking cigarettes around your children in terms of safety. Others may not. Still more will view using marijuana around your kids in any capacity as a negative. There’s so much uncharted territory, and it varies from one case to the next, it’s next to impossible to predict how a specific judge will react. In general, the courts will likely view marijuana consumption as marijuana consumption, no matter the delivery method. This is true whether you smoke, vape, or use edibles or other products. If it’s part of your life, it’s likely to become a topic of discussion in your custody case. Has the Stigma Around Legal Marijuana Changed? In states like ours, where marijuana is legal, the public stigma is changing. Old views remain, but they are evolving as it becomes normalized. Dispensaries are common sights, they look like the professional businesses they are, and there are even chains. It’s increasingly becoming a part of the everyday landscape. From a strictly legal standpoint, simply using marijuana recreationally shouldn’t negatively impact your custody claim. Still, the stereotype of the lazy, forgetful stoner persists. It’s sure to carry more weight with some people than with others, but it’s out there and you should be aware of it. Especially because you don’t always know how other people feel about the subject. You and your friends may not give it a second thought, but there remain negative associations in many circles. Think of marijuana use in terms of alcohol. Whether you drink whiskey or wine, you’re still consuming alcohol. And though it’s legal, it can still impact your case. If it compromises your ability as a parent, impairs your judgment, or use becomes a problem, it may pop up in court. If you find yourself in a hotly contested custody dispute, and frequently use marijuana, it’s entirely possible your ex might try to use it against you. Again, alcohol is a good comparison point. If you spend every night in a bar, that’s likely to come up. 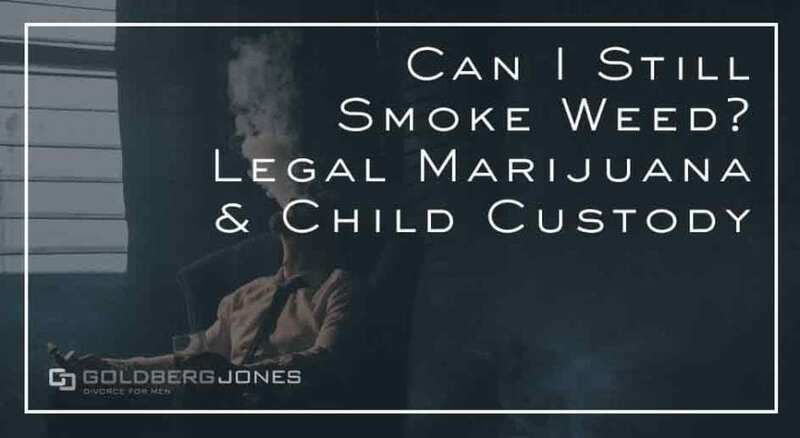 In short, even with legal status and changing views on the matter, since so much remains up in the air and subjective, it’s best to play it safe when it comes to marijuana use and your custody case. ORIGINAL POST: When Washington State voted to legalize the recreational use of marijuana in 2012, it opened up a metaphorical can of worms, legally speaking. Initiative 502, which passed by a 56% to 44% margin in a general election, allowed for adults over the age of 21 to possess and use small amounts of the drug for fun and games. It does, however, remain illegal on the federal level, and it is heavily regulated when it comes to who can buy it, where it can be purchased, and when it can be used. This decision had a big impact on taxes, laws, and even criminal proceedings—prosecutors quickly dropped most pending misdemeanor cases. Despite this newfound legal status, and the fact that you can buy it at one of the many stores popping up on the Washington landscape like springtime mushrooms, recreational marijuana use still carries a stigma with it, and it can have an impact on child custody cases. Since legal weed is a fairly new phenomenon, there is not a lot of hard data about how it impacts child custody decisions. There are, however, anecdotal stories popping up from all over the place, not just in Washington. a couple growing legal plants had their child taken away by the authorities, and there are more tales like this floating around. Many of these cases eventually went the way of the parents, with the courts deciding that the children were not in any actual immediate danger. Though this does illustrate a larger issue: legal marijuana use is a huge gray area when it comes to child custody and well-being. From a theoretical standpoint, legal marijuana use falls into a similar category as alcohol consumption. The reality, however, is that they’re not always treated the same way. As there aren’t any set-in-stone guidelines, cases are likely to vary a great deal depending on the people involved. Though Washington and an increasing number of other states now consider marijuana legal, under federal law it still falls in the same category as heroin, LSD, and other Schedule 1 drugs. While this shouldn’t directly impact your custody case, it speaks to the stigma attached to the substance. When many people think of marijuana smokers, rightly or wrongly, they often picture a burned-out dude sitting on a couch, surrounded by a haze of smoke, plowing through a giant tub of tasty cheese balls. While that may be very far from the truth—quite a few ‘regular’ folks indulge from time to time—it’s a difficult stereotype to get around. Child custody cases can be tense and hostile to begin with. If the issue is hotly contested between you and your soon-to-be-ex, it’s possible there will be mud-slinging involved. If you’re a regular marijuana user, this fact may be brought up as an illustration of why you’re an unfit parent, whether that’s true or not. The court likely won’t base a decision in your custody case solely on whether or not you use recreational marijuana, but it could very well be a factor. Occasional use is one thing, but if evidence shows that it significantly impairs your ability to take care of your children, or otherwise endangers their health and welfare, it can have a definite impact. Simple marijuana use won’t likely preclude you from winning custody of your children in a divorce, though it may play a part. There are, however, steps you can take to lessen the degree and to protect your custodial rights. Perhaps the biggest rule of thumb is, don’t be reckless. If you have paraphernalia, don’t leave it lying around where the kids can find it or have access. Regardless of the regularity of your use, you will want to take steps to limit your kid’s exposure to any controlled substances. If edibles, like brownies or cookies, are more your speed, keep them secure and out of the way in a place where your children aren’t going to happen across them when looking for a snack. In short, use common sense and don’t create an unsafe environment, or even one that can be construed as such. Again, going back to the alcohol parallels is a good place to look for guidance. If your marijuana use will negatively impact your capacity to look after your children, you probably want to leave the bong on the shelf for the night. Perhaps talking to your kids about it will help. It should go without saying, but if you’re going to be behind the wheel of a car, especially when your children are involved, you don’t want to be impaired in any way. Much like with cigarettes, smoking marijuana around your kids is also likely going to be frowned upon by the people deciding who gets guardianship and determining the extent of your visitation. Substance abuse, regardless of the legal standing of the intoxicant in question, is almost always going to come into play when the court establishes custody in a divorce. Marijuana is no different in that regard. It may be legal in Washington, you may be able to buy it at the new pot shop that just opened down the street, but you still need to be aware of the ramifications it can carry. And like alcohol, if you overindulge, or marijuana use becomes an issue in your life, it can become an issue in your custody case as well. The final decision will likely vary case-by-case and court to court, but you may want to refrain from giving your ex any additional ammunition when it comes to custody. If you do have questions about how marijuana use impacts your situation, your best bet may be to consult an attorney. Or if you think it could play a part, maybe take a break from Mary Jane until there is a resolution.